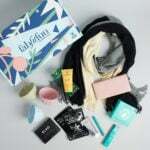 Deal – Use this link to get a bonus item with your first box! This palette is a mix of shimmers and mattes in warm browns. The pigment is good and the shades are pretty easy to blend, too. This dry shampoo smells fresh, absorbs oil, and sprays on clear. Checks all the boxes! This mask is designed to help minimize the appearance of enlarged pores. It’s probably my favorite item in the box – I loved how soothing it felt on my skin. The subtle scent was lovely, too. This is a gel cleanser/ exfoliant hybrid that is gentle enough to use daily. At first glance, I thought it had microbeads 🙁 but looking at the ingredient list, I think we’re safe! And the formula didn’t strip my skin of any moisture. This lotion is very lightweight and very fragrant. It’s a little too perfumey for me, but the formula is moisturizing and left my skin feeling very smooth. Verdict: This box has a value of about $47.32. That’s a decent value for the $21 cost, but not as exciting as some of the other boxes in this price point like Boxycharm. This box had a good amount of products that worked for me, though. Can you still get this box if you sign up today? Yes! If you sign up in the month of September, this will be your first box! Deal: Use this link to get a bonus item with your first box! What do you think of the September 2018 GlossyBox? I was not impressed. Very cheap stuff. Mood lipstick? Umm yeah, when I was 12! Lol. The spray reminds me of OFF bug spray. And they neeeeeed to back off on the masks! Ugh. One more month… I will see. But yeah, I will be a prior subscriber too if this continues. I bought a pack of 10 of these mask at Costco for $11. At that price the value of the mask is just over $1. So far I’ve only used the charcoal mask, it’ just ok nothing to write home about. Cream Charcoal mask are definitely better. Unlike the other commenters, I really like this box, and would’ve used everything in it. I no longer subscribe though, because guaranteed this is not the box I would’ve received. The variation-thing drove me crazy, and I often ended up with the worst variation IMO. So, no to Glossybox. Dollar General items. Glad I canceled. I agree that this box looks pretty low value. It’s too bad because GB used to be one of my favorites. There’s not a single item in this box I would use. Those color changing lip products are always too fluorescent pink on me. I have loads of better lotions and shampoo. I wonder why The HUT Group has added so many low cost, cheap and cheap= looking products to the Glossyboxes and Look Fantastic boxes all of a sudden. Mane ‘n Tail in Look Fantastic, and drugstore quality Pssst, MoodMatcher lipstick ( I used the original in the 70’s in HS- was a trend with mood rings LOL). Nothing in this box is a product I’d buy OR use. If I’d paid for a yearly sub with either GB or LF, I’d be really concerned about what the future holds. I’m sorry, but this is the worst box!!!! September, October etc.., every month is terrible!!! I used to be a suscriber last year and anything has changed, terrible box!!!! I just subscribe because of the Sunday Riley free product, but now I regret not choosing an other awards box. I’ll not recommend this box to anybody. I agree, Glossybox has gone way downhill lately in terms of including well known and quality brands and retail value. I really used to enjoy this sub box, with familiar brands and new discoveries. There was a nice balance, I thought. Lately there have been a lot more “drug store brand” inclusions as well. I don’t see myself continuing to be a customer if the trend continues. I received the lip product in black and I got the body mist instead if the lotion.